Learn the benefits of routines vs. schedules for an orderly school day, and every day! Plus, check out these 7 tips for designing your own daily routine. Schedules and three-year-olds don’t always mix well. The schedule starts out beautifully, especially on paper, with color-coded time boxes for everything from meal-time to story-time. It fits all the necessary events in tightly and wraps ’em all up just in time for the end of the day. Then, after a brief lapse of discipline on your part and a temper tantrum on the three-year-old’s part, we’ve skipped the morning weather check for the third time this week and rushed through a quarter of this morning’s lessons. And then, just as Suzie finally seems focused with an activity, it’s time for lunch. Continue on as a drill sergeant. Show no mercy to poor Suzie. It’s lunch time and we have a schedule to keep. Struggle against your kids/students all day. Abandon schedules and structure altogether and go with the flow all day. Ignore Maria Montessori’s words concerning order. Accomplish close to nothing. Develop a routine instead of a schedule. Find stability in the order of the day, and freedom for spontaneous activity. Experience less stress, more joyful days, and easier resets after difficult days. Let’s go with option 3, shall we? But first…what’s the difference between a routine and a schedule? Put simply, a routine is a schedule with few or no time limits. Within this general routine are many smaller routines. For example, during the three-hour work period, each child must choose a work, work at it for as long as he wants, then put it away where it belongs. If a child needs to use the bathroom, she needs to let the teacher know first, and wash her hands afterwards. She knows how to wash her hands, because there is a routine: turn on the water, rinse, get soap, scrub, rinse, turn off the water, dry hands with the towel, put the towel away. 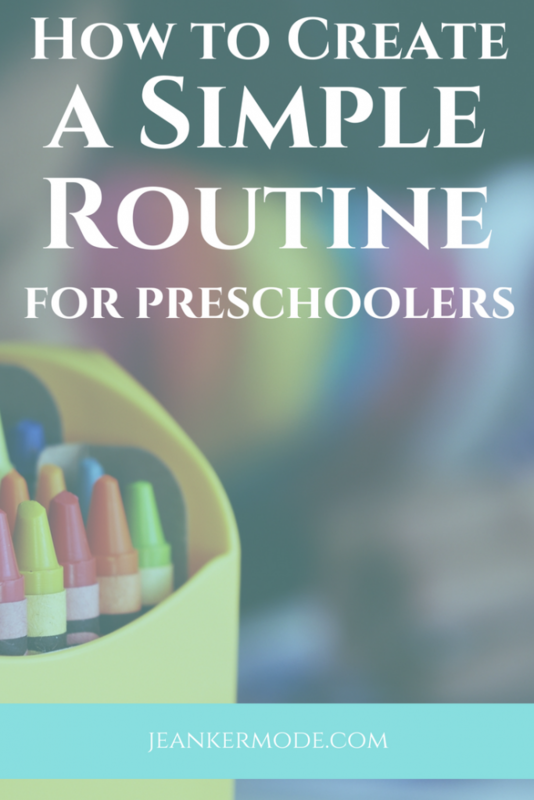 In a Montessori environment, there is a routine for everything. There is a routine for entering in the morning, for choosing work, setting up the snack table, working outside, washing the paint brushes, setting up for lunch, and cleaning up after lunch. You name it, there’s a routine for it. Set times, not so much. There is no set time for snack. No set time for math. No set time for art. No set time for moving the whole class from one 30 minute time slot to the next. Even the lessons follow a routine instead of a schedule. Montessori guides do not follow a daily curriculum. They follow the order of presentations. For example, a Montessori guide does not plan out each day the way a traditional teacher does. She does not decide that today everyone will learn addition. Instead, she observes each child to see when he is ready for the next lesson in math, the next lesson in language, the next sensorial lesson, and so on. The order is the same for every child, (e.g. addition always comes before subtraction, and the pink tower always comes before the brown stair) but each child moves through the order at his own pace. This requires attention on the part of the guide. She has to stay on her toes to make sure each child is getting the right lesson when he is ready for it, not too soon, and not too late. But, in the long run, it brings much more peace to the classroom. Why should we go with a routine instead of a schedule? How can we make sure everything gets done if it’s not time-blocked? A routine balances order with flexibility. Order is essential for the young child, who is learning her place in the world. External order leads to internal order. Without it, the child has no frame of reference as he build his mental organs. Many behavioral difficulties can be eased with external order. But, all children are different. 30 minutes of math might be too much for one child and not enough for another. It might be just right one day, and impossible the next. By following routines instead of a rigid schedule, we are better able to follow the child, to see what each individual needs, and to give it to her. A routine allows time for concentration. Concentration is golden. A child who can concentrate can use his will to pay attention to something worthwhile. This is an irreplaceable power. (Think: success at school, success at a job, prayer, etc.) But, by moving children along according to a fixed schedule, we often interrupt their concentration. Suzie was finally concentrating! That is so much more important than what time we eat lunch. In a Montessori routine, there is a 3-hour work period. During this period, a child can work on one thing the whole time if he likes. Or, he can move from one activity to another. It all depends on his concentration abilities and his interests. A routine gives room for the unexpected, or for mistakes. The most difficult thing about a schedule is the fact that we are constantly running behind. A child has an accident, or the teacher thinks a certain project will take less time than it does, and the rest of the day is spent trying to catch up. With a routine, there is more time for these hiccups. If a child has an accident at snack time, there is no hurry, and nothing is missed in the time spent cleaning up. If a science project takes 15 minutes instead of 10, the language lessons won’t be rushed. After a difficult day, we just pick up where we left off. A routine helps build discipline. While a routine does leave room for error, it still helps both children and adults to grow in self discipline. A routine only works if we follow it as best we can. But with clear guidelines, it’s doable. For example: always put the work away as soon as you are done with it; be ready to greet each child as she enters the classroom. For a child especially, knowing what to do is a huge step toward self-discipline. But what about those things that really need to happen? If something really must happen at a certain time, that’s fine. A handful of set times can be helpful in giving structure to a routine. Montessori schools all have set start times and end times, and families are encouraged to arrive promptly. It’s good for children to learn to respect others by being on time. The key is to choose these set times well, and give enough time in between them for concentration and flexibility. So what do I do if lunch happens at a set time, and Suzie is still focused on her work? Don’t interrupt her unless it’s absolutely necessary. Start lunch, and she’ll probably notice what everyone else is doing, finish up her work, and join you. Minimize. Choose a few set times, e.g. drop-off time, lunch time, etc. and then eliminate all other time blocks from your schedule. Let go of the need to control what happens when each day. Create the overall structure using those set times, and make sure to leave several open hours for work. Plan a general routine for the day. Give this a little thought. It’s best not to change routines too often. You can include your kids or students in planning. Make a list of the days events, and the order in which they usually happen. For example, after breakfast, we clear the table, load the dishwasher, and wash our hands. Start living the general routine. You can make a chart or a routine book if thats easier for you, but it’s not necessary. If you do the same basic things in the same order each day, your children and students can pick it up. Consistency is key. Address each smaller event as it comes up by creating a routine. These smaller routines might include: how to wash your hands, how to put your work away, how to set the table, how to put your shoes on before going outside, how to bring in the mail, how to feed the dog, how to water the plants, etc. Many of these you can create in advance, but it can be hard to think of them all at once, and there will always be surprises that come up. Remember that each day will be a little different. Maybe one day your kids will spend most of the morning inside reading books, and the next day they will want to sweep the patio, play the subtraction game, paint a picture, and help you make lunch. That’s awesome. If you’re teaching, follow the order of presentations. Don’t schedule the lessons into the day, but be diligent in knowing who needs what. Watch and wait for the right moment to give a lesson, and never interrupt a child who is concentrating. 👉🏻👉🏻👉🏻 Get your printable routine book template here! A routine book can help young kids to understand and follow each routine. The kids can help you fill it out, and draw accompanying pictures. Got questions? Let me know in the comments. Or just share your best routine-setting tips! FREE routine book template included in resource library below! this was incredibly helpful. I have been home schooling on and off for a few years with an increasing number of kiddos (we have six now, with two in school, 3 home schoolers). Without having read Montessori (I know, I know! I am catching up now! ), I made the observation that my kids need order and structure in order to be calmer and more focused, even when very young (like 2 years old). I also LOVE my schedule (home school or otherwise – I am German), but little by little, out of sheer frustration, I kind of slid into what Montessori describes as “routines”. 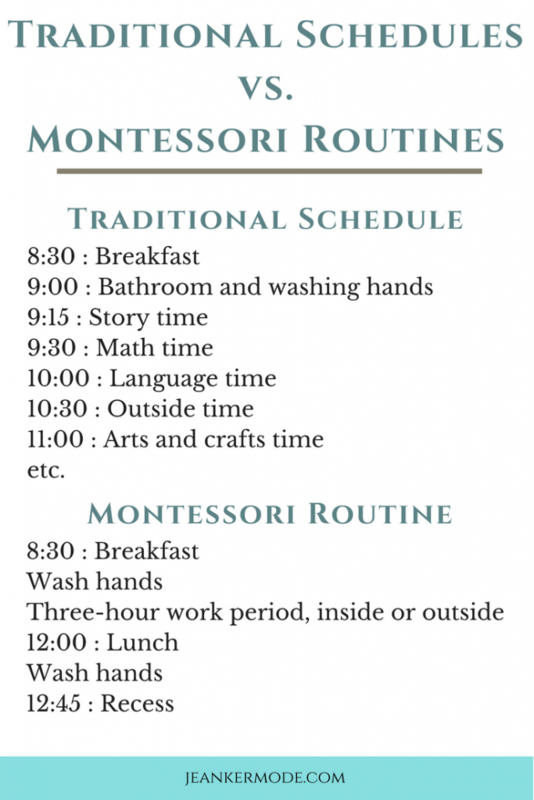 So, had I done my home work years ago and read Montessori, I could have skipped some of that frustration part and just started with routines instead of schedules, INTENTIONALLY. It’s not too late, of course! So thank you very much for this! I’m glad this was helpful! I love routines in a classroom, but since I am not a mother yet I wasn’t sure how well they work in a home. So it is good to hear from you! Jean, this is brilliant. Thank you for sharing. How does it work in a classroom, or with a passel of Suzie’s (the average large, homschool family)? Thanks, Auntie! I saw routines work really well in the school where I did my practice teaching in San Diego. The kids (for the most part) knew what to do throughout the day. For example, there wasn’t a set snack time as in most schools. Instead, snack was set out on the table, and the kids helped themselves when they were each ready. Only two were allowed to eat at a time (so it didn’t turn into a party) and as there were only two chairs at the snack table this was easy to enforce. There were signs that said how much each child was allowed to serve himself, e.g. 4 crackers and 3 orange slices. Some kids needed reminders to go eat, and the teacher kept an eye on whose plates were in the dirty bin to make sure everyone got snack. That’s just one example of a routine that was flexible to meet everyones needs but still provided structure. The idea is that it will work in the same way in a home; e.g. make a snack drawer in the fridge, and everyone can take one or two things in the morning, for example.